You are Galahad, son of Lancelot. During your lifetime in the service of King Arthur you will undertake many quests, and history will tell of your deeds for centuries to come. Today, alone, you embark on perhaps the most dangerous one of all. High atop Tower Tarr in the Eastern land of Kasako lives Miragorn Cimmerian, a great and powerful wizard with an evil agenda. In an attempt to draw King Arthur to him, Miragorn has stolen from Camelot's treasure hold several of Arthur's treasured artifacts. Though all are precious to Arthur, Miragorn knew that material objects alone might not be enough to move the king from his throne in Camelot. To seal Arthur's invitation, he has also kidnapped Princess Leandra of Psygnosia and he's holding her in Tower Tarr. On a quest rivalled only by that for the Holy Grail, you must retrieve the artifacts, rescue the princess, then confront the evil wizard in a battle to the death. All of Camelot is counting on you. 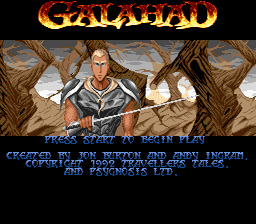 Good luck, Galahad. --From the Genesis Galahad instruction manual.